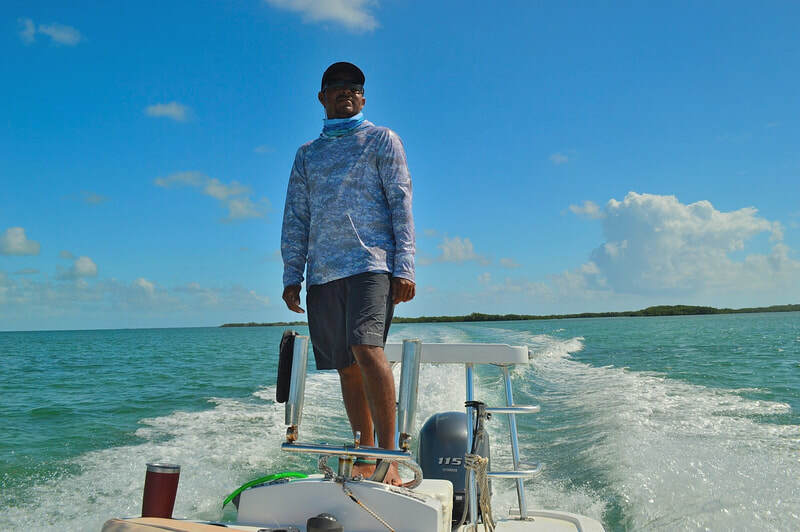 ​Forrest Wood, founder of Ranger Boats, is often credited with saying that "you are never sorry that you bought the best". 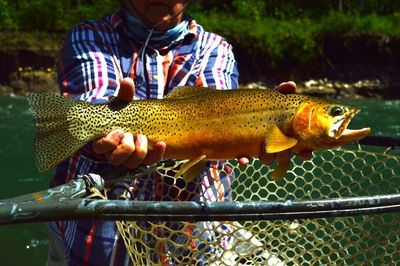 I think there is a lot of wisdom in this and the same can probably be said for the destination fly fishing experience. 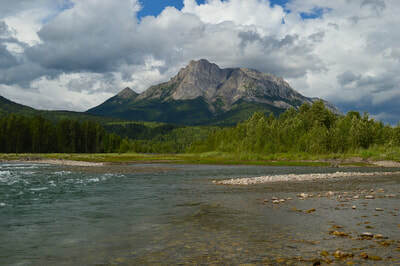 That is why I am so selective in the places I choose to host fly fishing adventures. 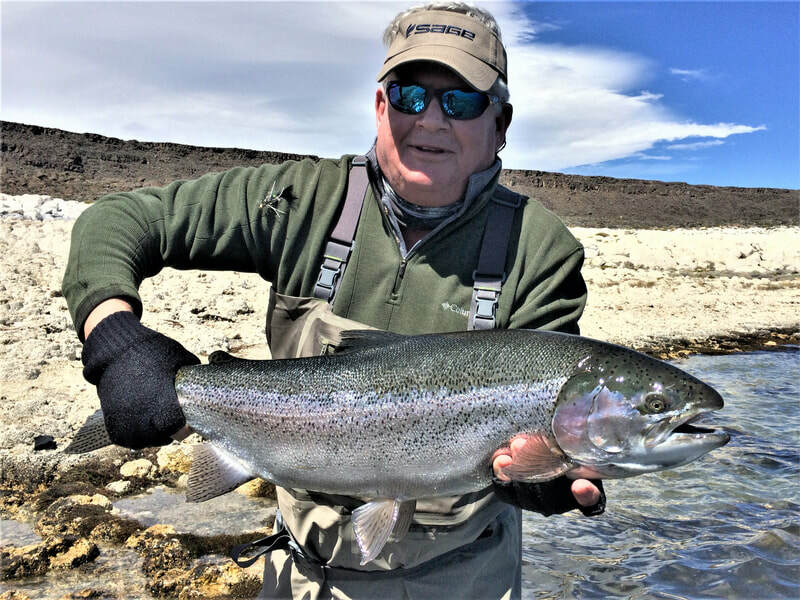 After hosting two trips to Estancia Laguna Verde (ELV) I have found that no one is ever sorry that they traveled thousands of miles to fish Jurassic Lake at least once in their fly fishing life. 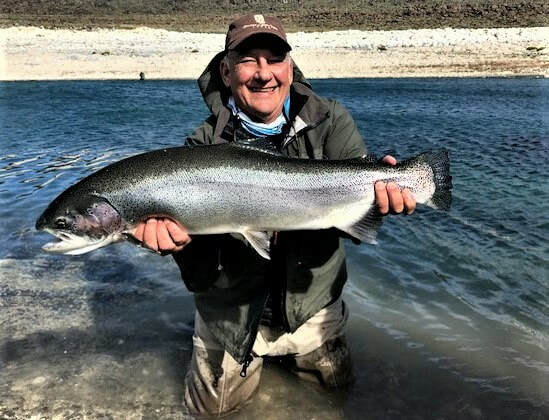 The place is simply incredible and has truly lived up to it's claim of "the best trophy rainbow trout fishery on the planet". 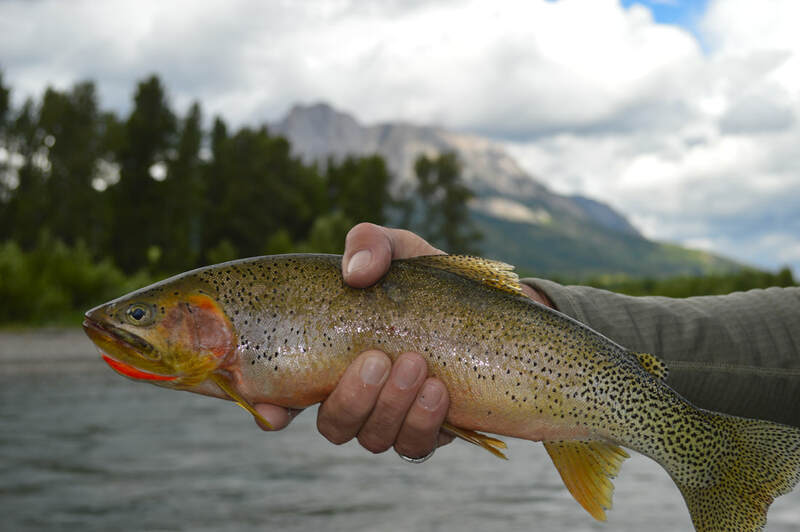 I am not fond of superlatives and absolutes in fishing for I believe fishing is all about probabilities. 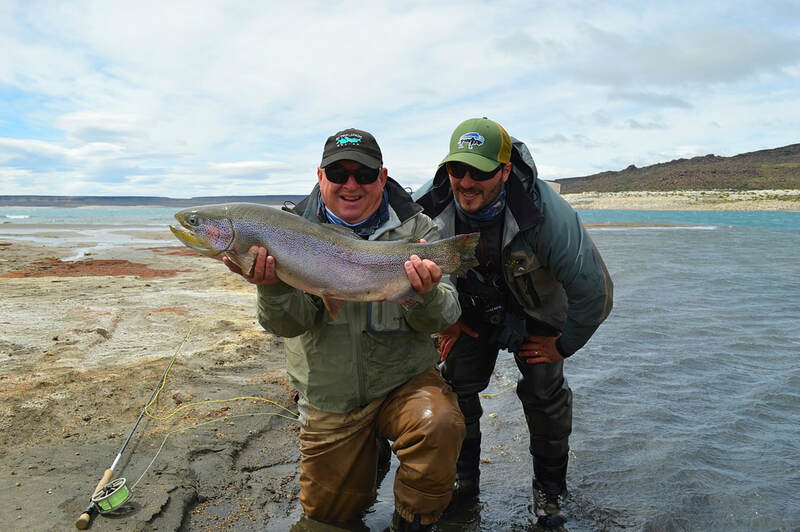 Yet the fact remains that there is not a better place to go if you want to catch a trophy rainbow in the wild. 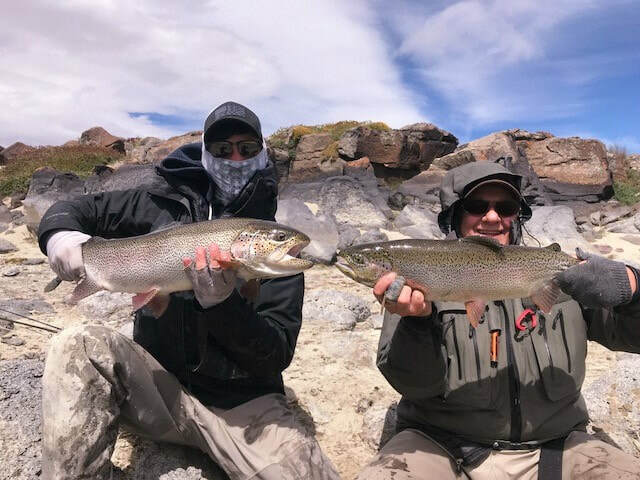 Every year 20 pound rainbows are landed and released. Ten to twelve pounders are common. So I could not be more pleased to announce the dates for my third hosted trip to Jurassic in January of 2020. We will be based out of ELV, a lodge that always exceeds expectations in one of the most remote parts of the world. The Fishery: Lake Strobel (a.k.a. Jurassic Lake) is a huge 25 square mile Patagonian lake in the Santa Cruz province of southern Argentina. 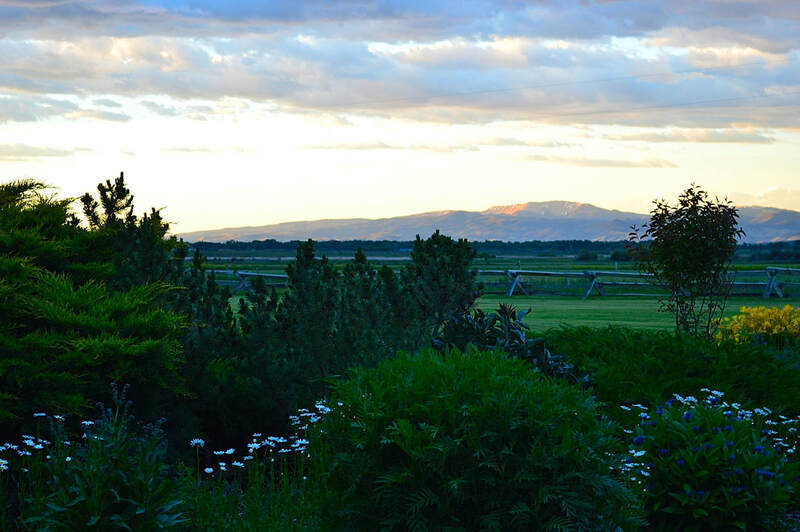 It is remote, ruggedly beautiful, the Andes mountains in sight just to the west. It is clear, cold, and contains excessively abundant scud populations. The trout are without any real predators and they grow big...very big. ​Genetics are one of the reasons fish are big here. 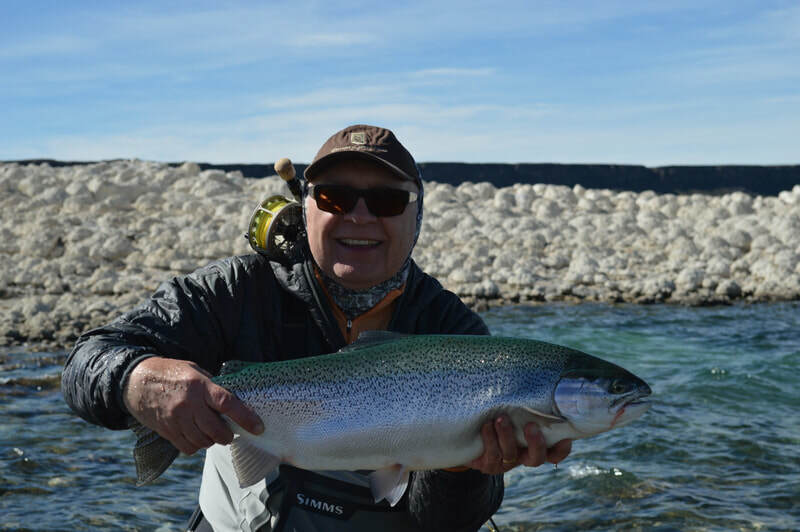 These are wild, coastal rainbows and the Strobel population exhibits both the typical rainbow form and the steelhead form. 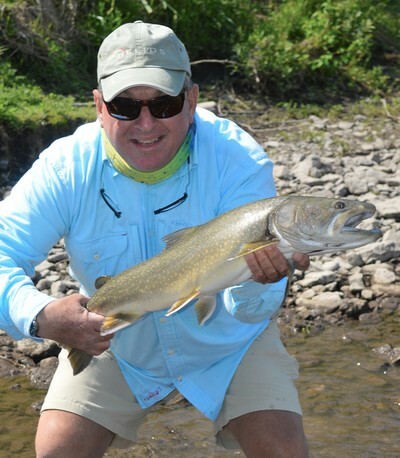 It is often said that the trout average eight pounds here. Experience has proven this to be true. 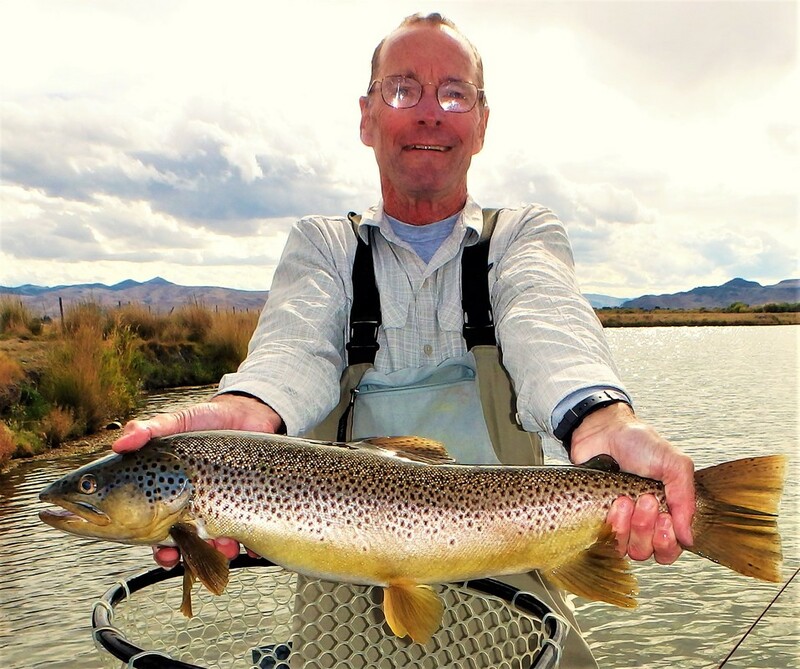 The fishing at ELV is not just one dimensional, there is more than just Jurassic Lake. 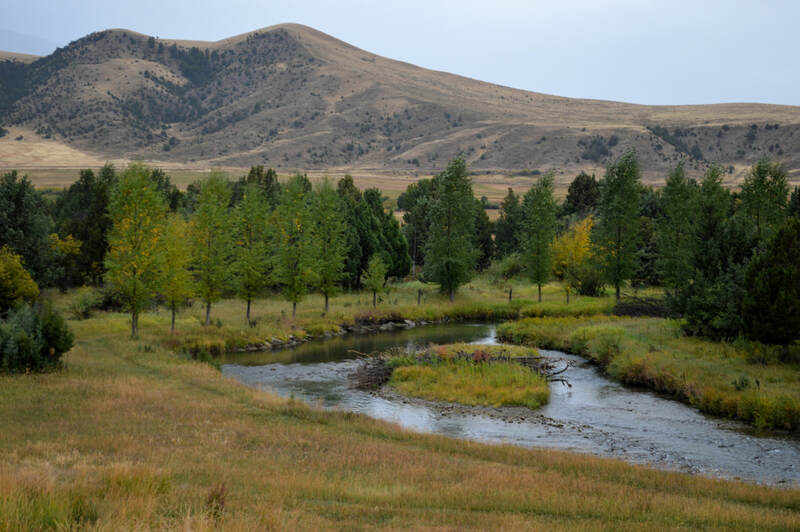 Also available is a major freestone river, several smaller lakes, and a small creek, much like a spring creek. 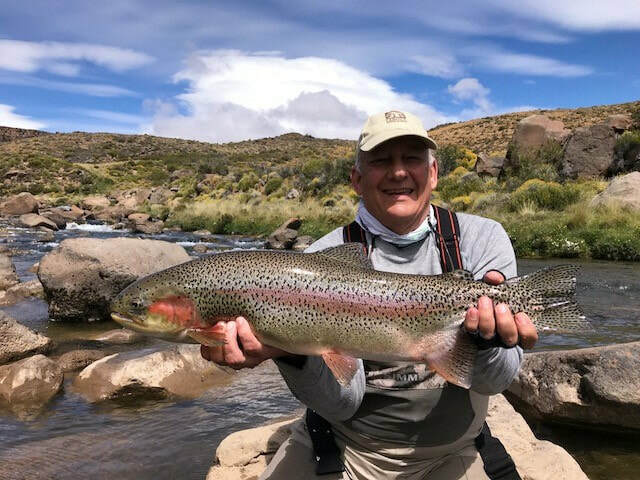 The Rio Barrancoso is a beautiful, ruggedly steep, free flowing river that flows undisturbed from the slopes of the Andes into Jurassic and serves as the spawning and nursery areas for the fishery. A very short river, I have stood in one place on the estancia and I could see both its source and its mouth in one panoramic view. 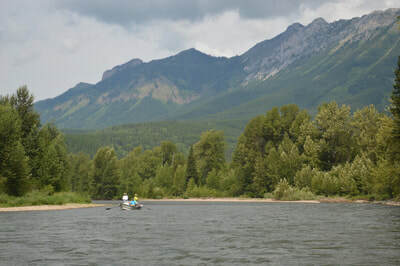 The river has three sections, each containing two beats. Although "smaller fish" are caught in the river it still contains many of the giants, just as the lake does. The river is where the mouse videos were recorded that have become so popular. Small lakes called lagunas add still another dimension to this adventure. 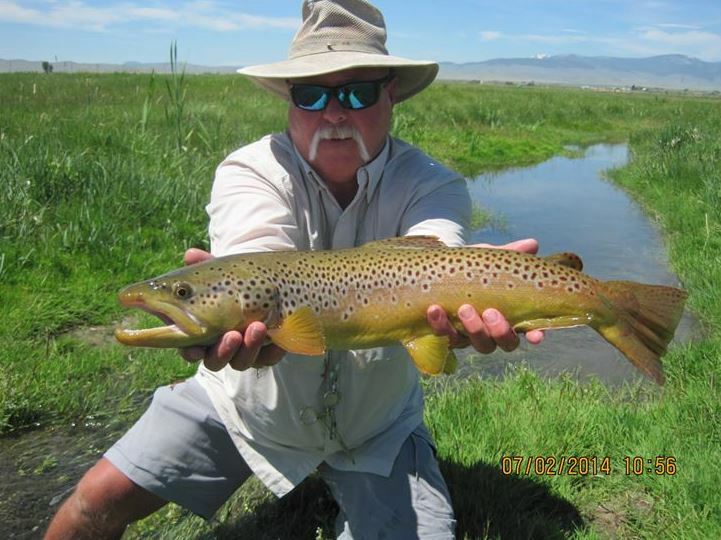 These lagunas are filled with fish and provide a great option on windy days. The fish are still big and they still fight big. 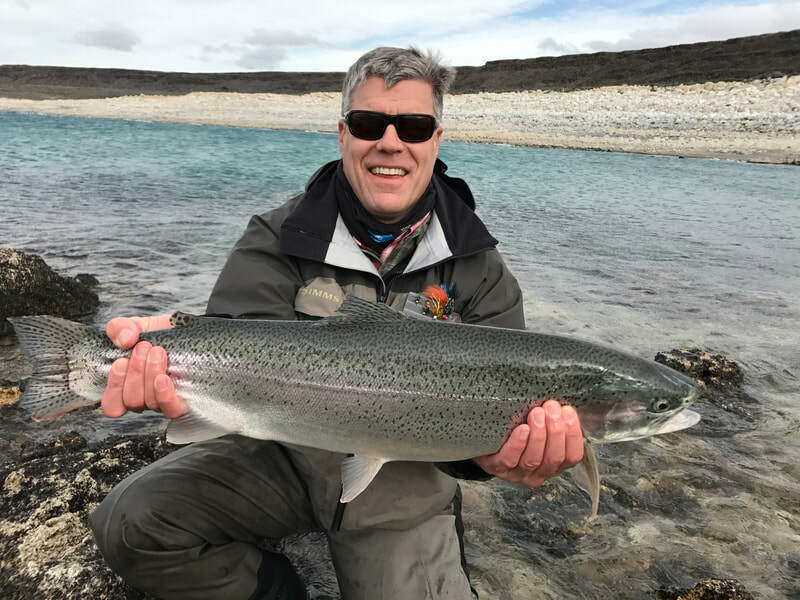 During the 2018 trip we fished the lagunas frequently as they were producing lots of fish between five and ten pounds. Moro Creek adds the final dimension and is similar to a spring creek. 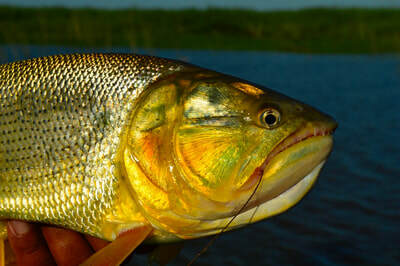 The estancia fishes four beats on the creek, usually during the spring or early summer. 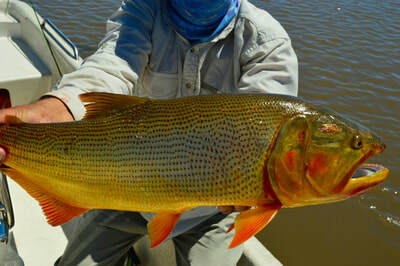 ELV offers exclusive access to much of this fishery including over 25 kilometers of Strobel Lake shoreline fished from either the main lodge or a smaller outpost lodge for one or two night stays; over 10 kilometers of the best sections of Rio Barrancoso; about 10 kilometers of Moro Creek and at least eight lagunas. 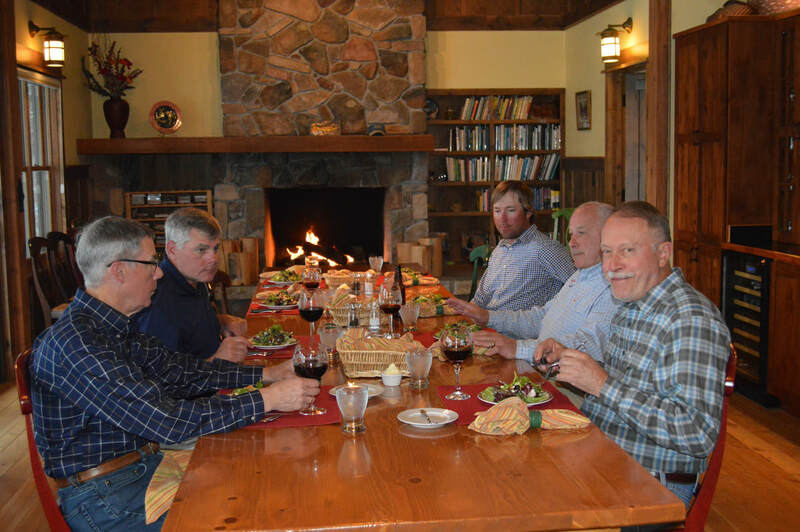 To say that you will probably not see anyone else other than those staying at the lodge is an understatement. For me, the remote and isolated character of this place is such an important part of this adventure. When I am there I am reminded of the words "excellently lonely" from John Inglis Hall's classic work, ​Fishing a Highland Stream. 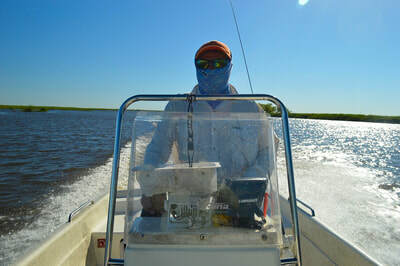 Typically, a wide variety of fishing techniques are employed here. The big lake is usually fished with dries, dry/droppers, streamers, and scuds stripped slowly just below the surface. The river is a place for dries and mouse patterns. 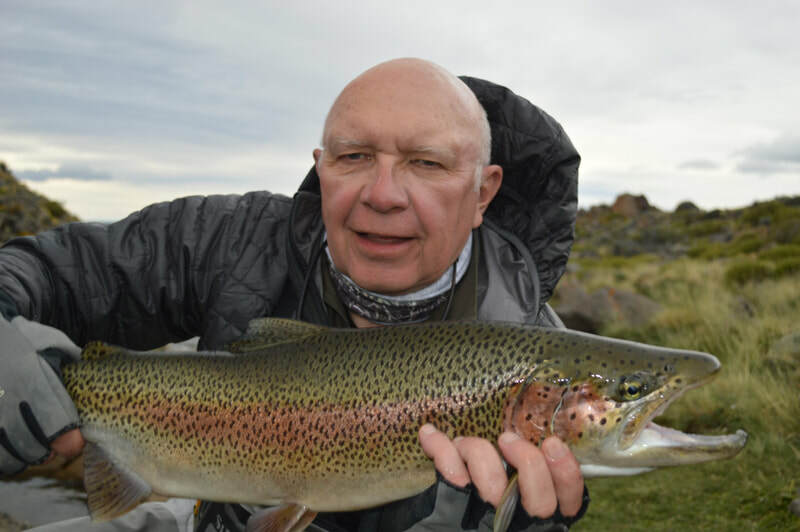 The lagunas fish well with streamers and dry/droppers. 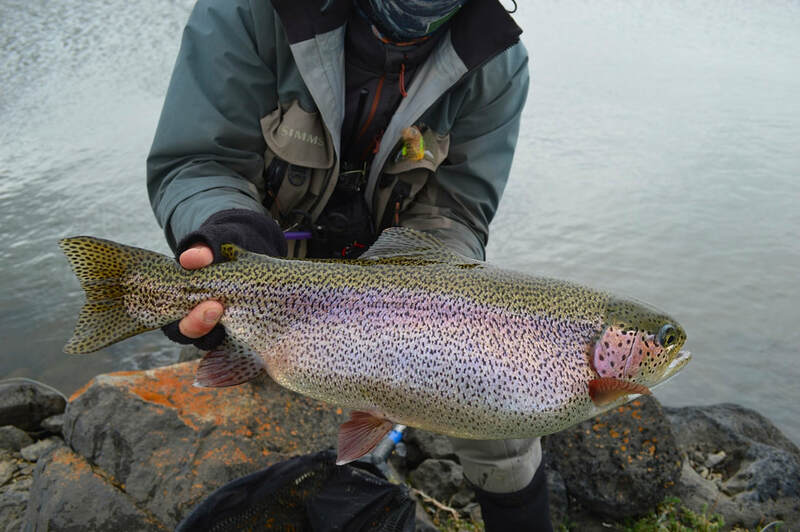 The gear list is a little odd for a rainbow trout expedition. 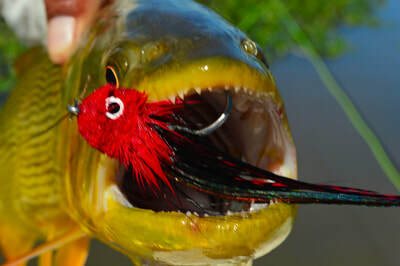 For most of the fishing you will need 8 or 9 weight rigs with leaders of 16 to 20 pound test. 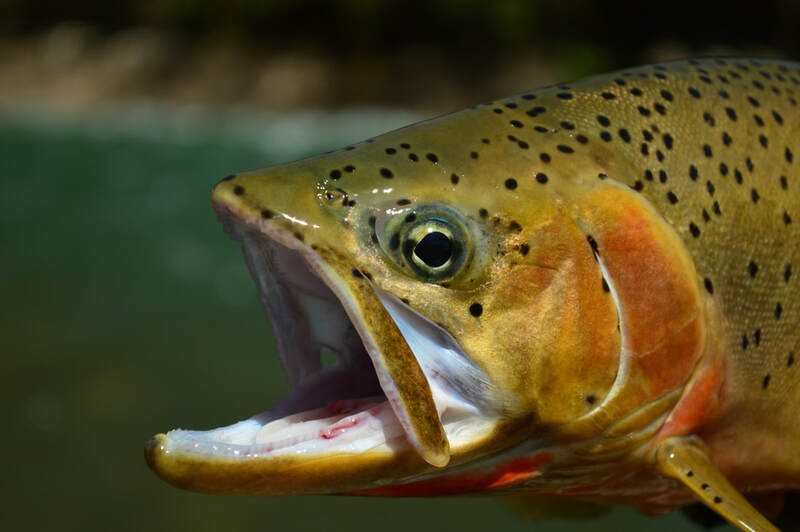 The greatest challenge in putting the gear together is acquiring trout flies tied with hooks that are strong enough not to straighten or break with these fish. 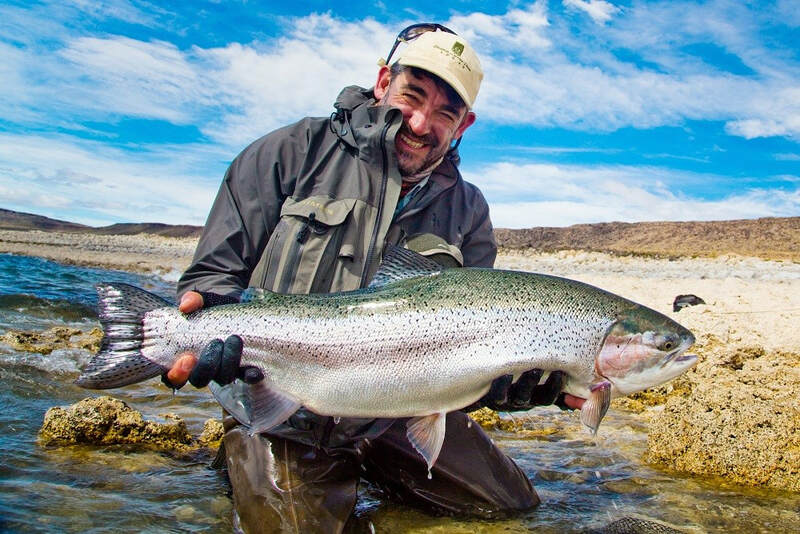 These wild coastal rainbows are full of fight. 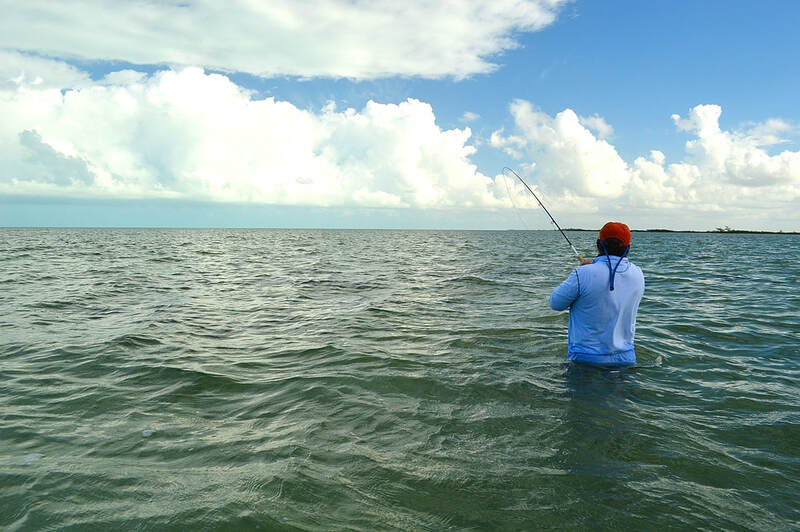 In all the waters, sight fishing is very common though it does depend on conditions. 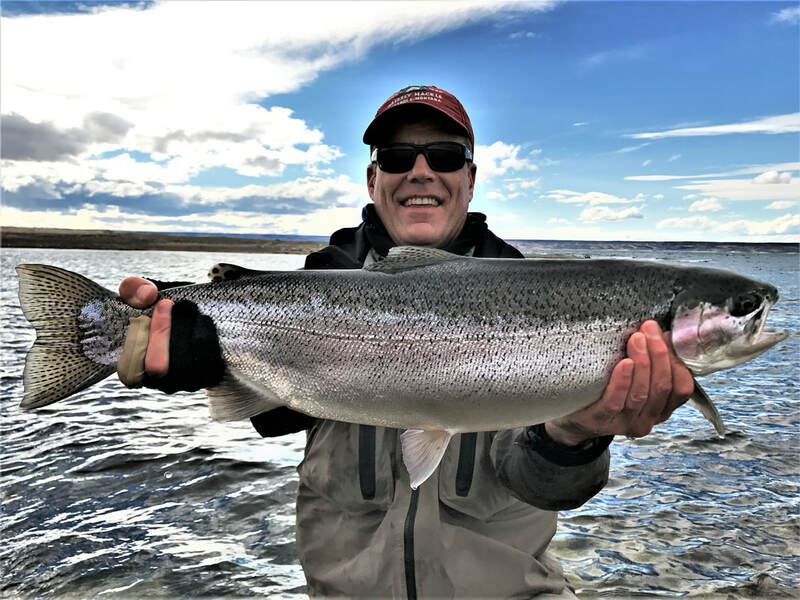 All I can say is that you will never forget the sight fishing at ELV...the size, the numbers of fish, and the clarity of the water make this a different ball game. They guides are professional, personable, experienced, knowledgeable, and English speaking. 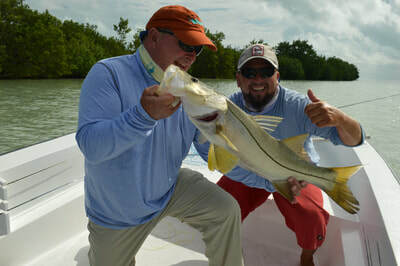 Nano is a commercial tyer, Manuel is an FFI Certified Casting Instructor, Martin and Ivan are simply a joy to fish with. 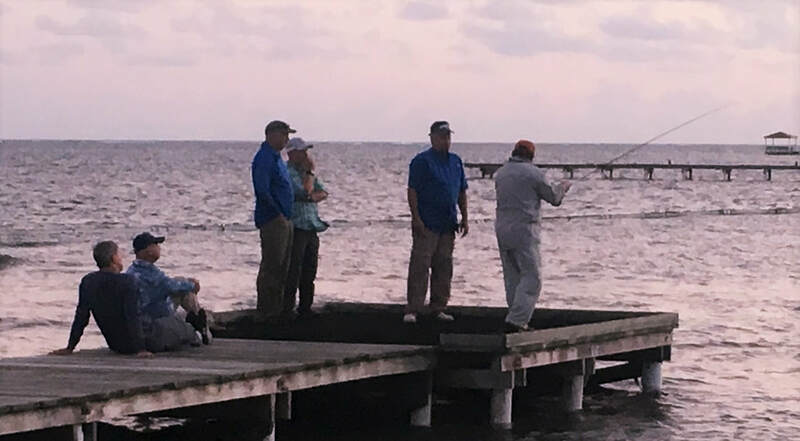 Each morning anglers pair up with their guides and drive a few minutes to the chosen water for the day. 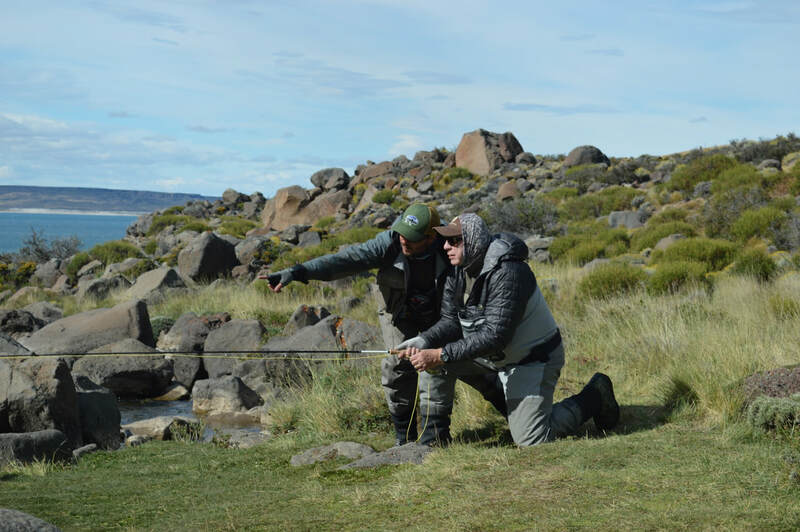 On the big lake you may fish places with well known names such as Monster Bay, Dry Fly Bay, Tasmania Bay, Sea Bay, Camelot and others. Hot lunches are prepared in convenient, lake-side shelters that maximizes fishing time and comfort. Both the 2017 and 2018 trips were incredible. (see photos below) It still seems odd that we stopped taking pics of smaller eight pound rainbows after only a short time. 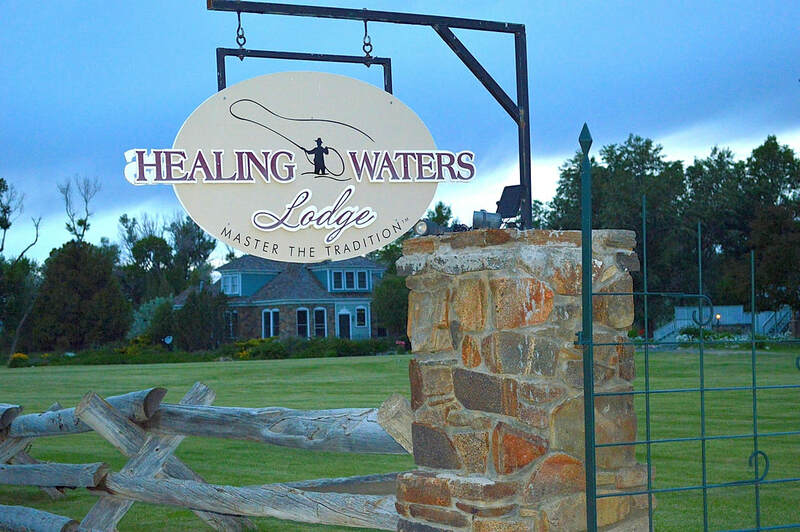 The Lodge: The lodge building is a restored and expanded stone ranch house that retains its classic Argentine estancia architecture and provides all the comforts of home and more. 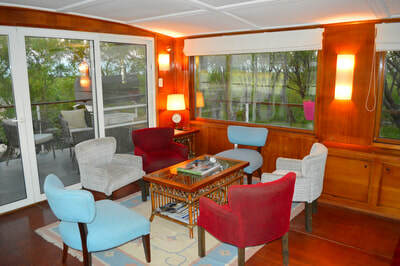 It is located on a small laguna and is only minutes away from Jurassic Lake, the river, and the other lagunas. Each of the angler's rooms contain two single beds and en-suite bathrooms. Single upgrades are available. 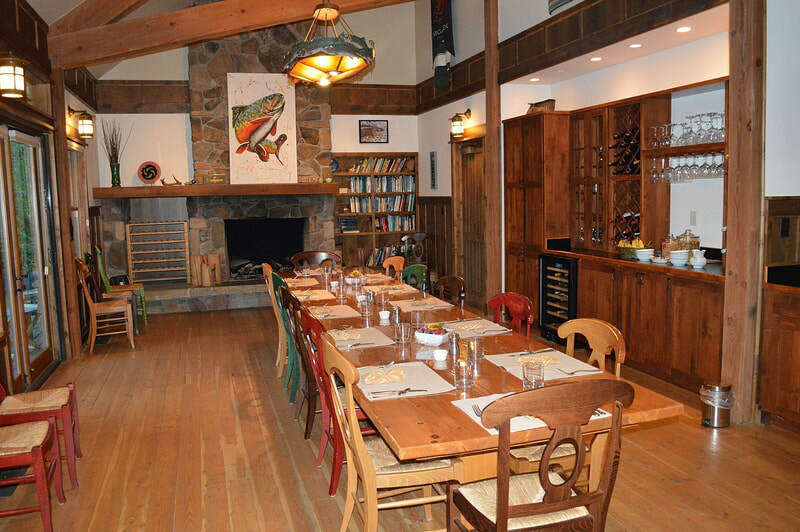 The main lodge has a spacious living and dining room plus a viewing area overlooking the laguna, complete with a viewing scope for wildlife. Just outside the main lodge is a comfortable changing room for getting into and out of your waders. 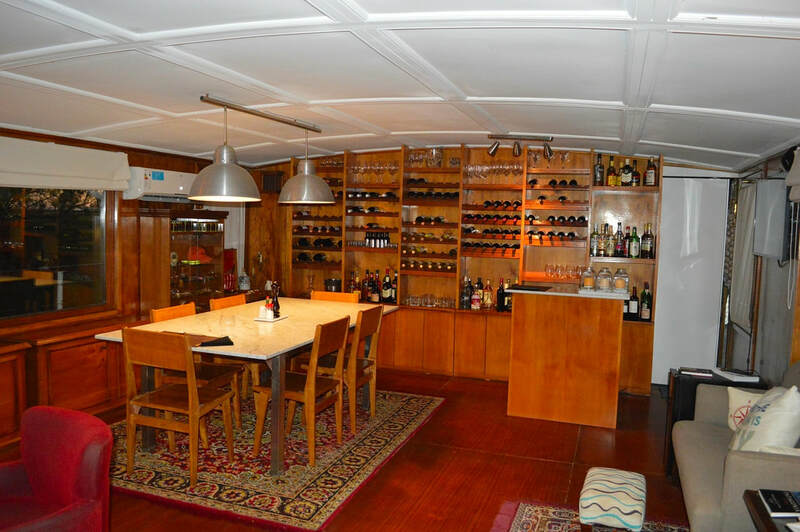 Windmill and fuel powered generators ensure all the energy needs are met. 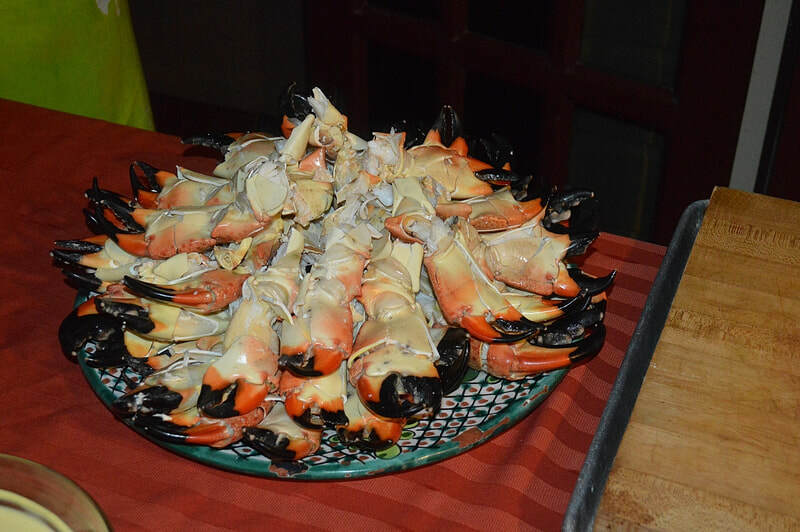 The world class cuisine is all chef prepared and consists of carefully planned, three course meals and asados. 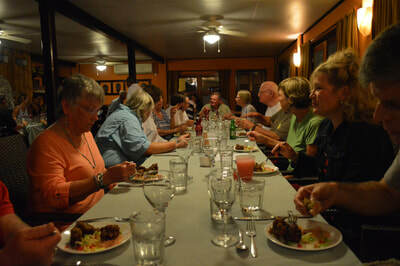 The local Argentine beef and lamb is famous for a reason. Beyond incredible desserts and outstanding Mendoza wines, personally selected by the owners, complete the dining experience. Dietary restrictions are gladly accommodated. 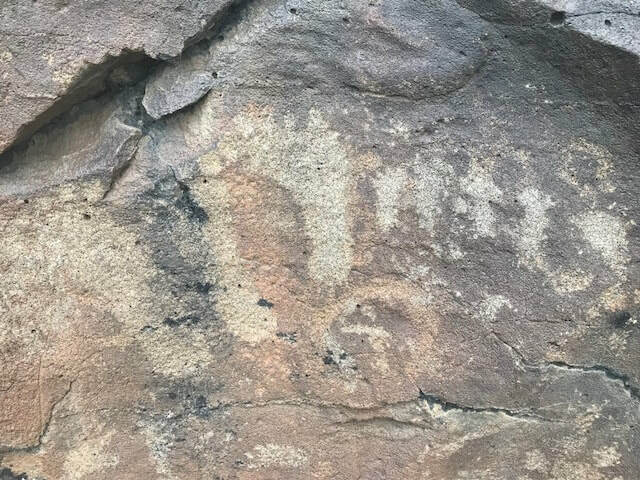 The Details: Trip dates are January 2-12, 2020. Cost is $6775. 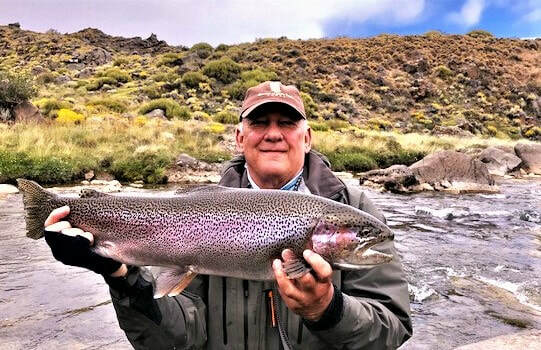 The travel to ELV is substantial, but I have through experience worked out a great plan to enjoy a leisurely trip and arrive at the lodge rested and ready for a great fishing adventure. We fly overnight to Buenos Aires, arriving in the morning. We are then transferred to our hotel where we check into our rooms. That afternoon we take a private bus tour of Buenos Aires returning to the hotel for dinner and sleep. The tour includes the most interesting and historic parts of the city and allows time for visiting a arts district and shops. On January 3rd we fly (about 3 hrs.) 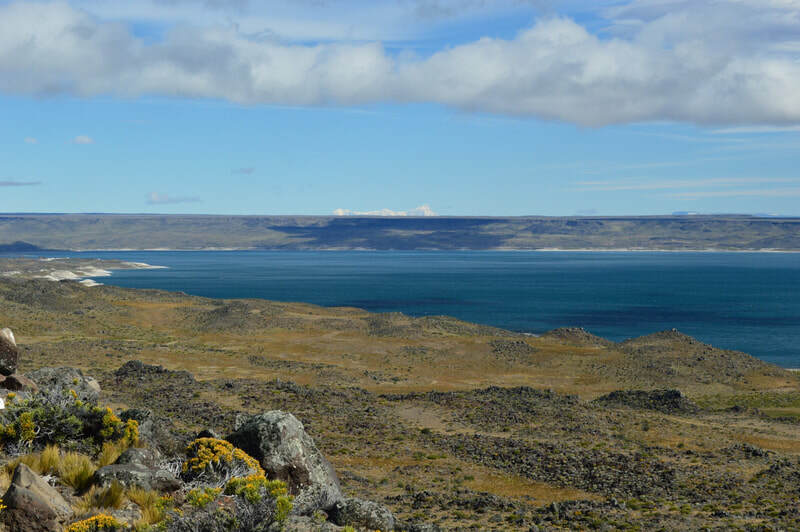 to El Calafate, a charming outdoor oriented village where we will lunch and spend some time in the shops, cafes, and restaurants. 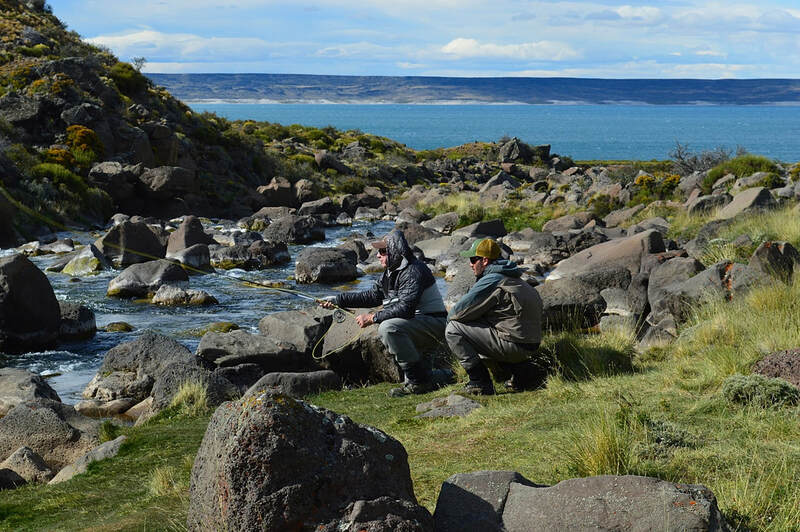 After overnighting in Calafate, we will be transferred to the lodge for lunch and an afternoon of fishing. 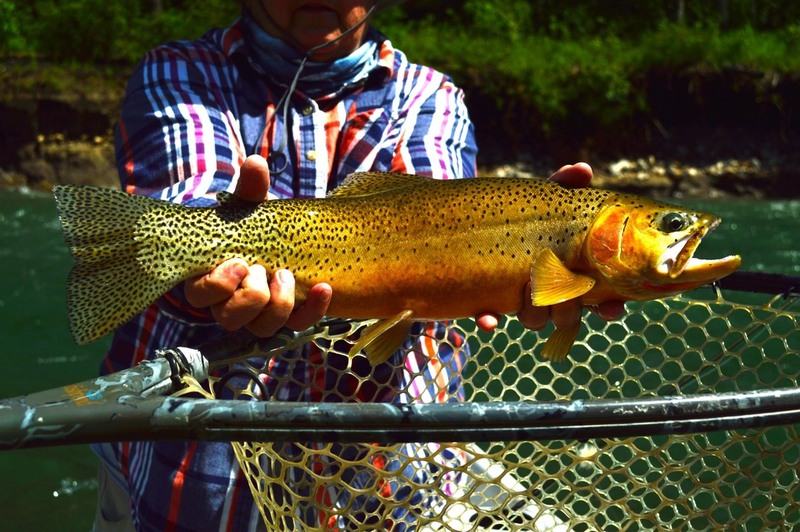 Six full days of guided fishing will follow. 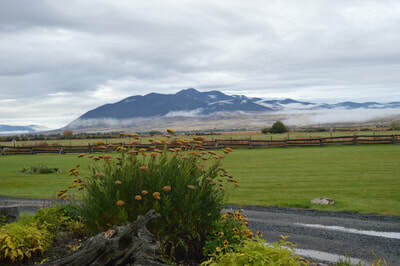 After breakfast on January 11th, we will be transferred back to Calafate to board a plane bound for Buenos Aires and overnight there in the same hotel. The next day we will have some free time to explore Buenos Aires and then return to the airport that evening for the return flight back to the US. 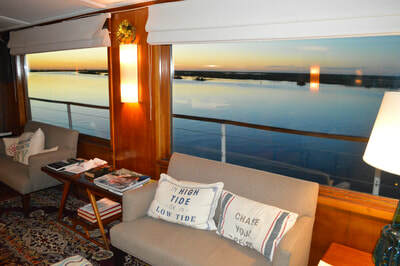 All of the transfers (included in the package) are private, English speaking, professional guides and involve modern, comfortable vans. The afternoon tour of January 2nd (also included) will visit many of the interesting and historic sites of Buenos Aires and also allow some time for strolls through the arts district with coffee and gift shops. Intersur Recoleta in Buenos Aires is an upscale hotel (also included) in a very nice part of the city within a trendy arts and restaurant district. Parque Place Hotel (also included) is the perfect place to enjoy Calafate on the shores of Argentino Lake. This is a customized package that you will not find elsewhere. Space is very limited. Add to this two for one pricing and we have the makings of something special. 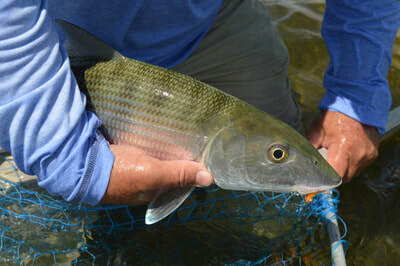 Join me on a hosted fly fishing adventure trip to Belize this coming October as we fish for bonefish, permit, tarpon, and more. 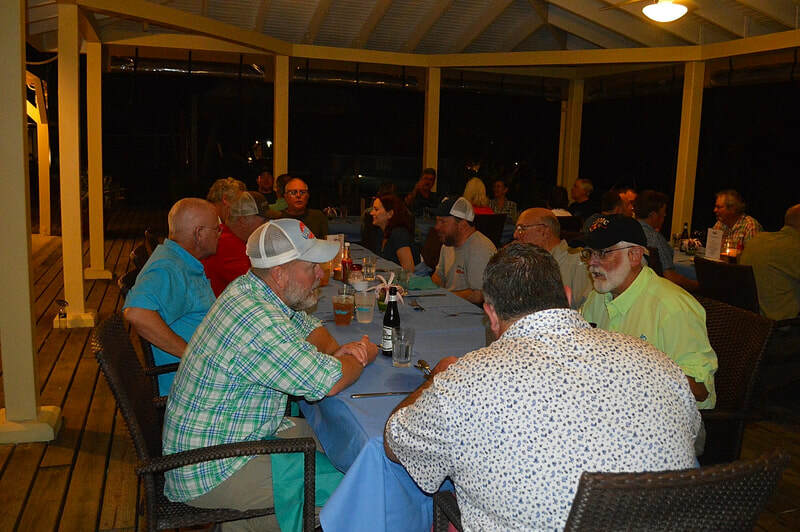 This will be my 7th consecutive year to host trips to El Pescador. 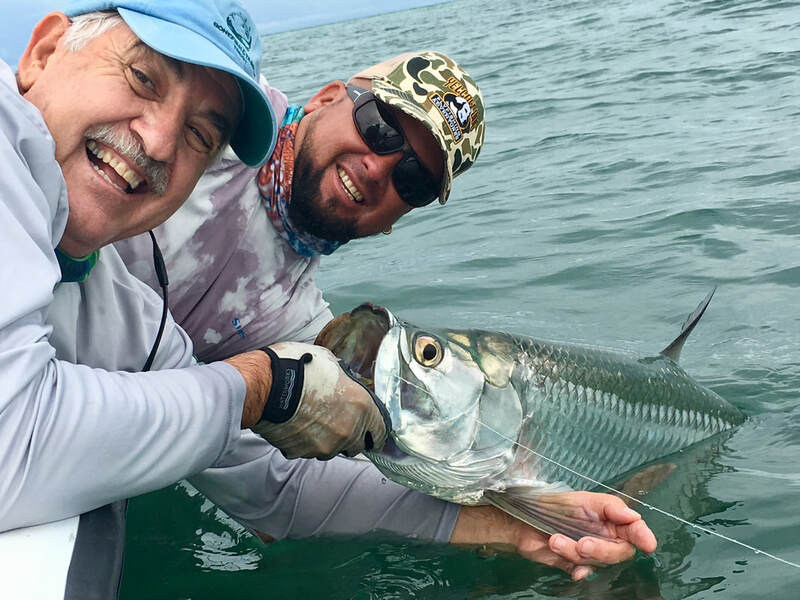 El Pescador is one the best places in the world to achieve a saltwater Grand Slam…bonefish, permit, and tarpon. Bonefish abound in shallow flats and schools of permit cruise the deeper flats and edges. 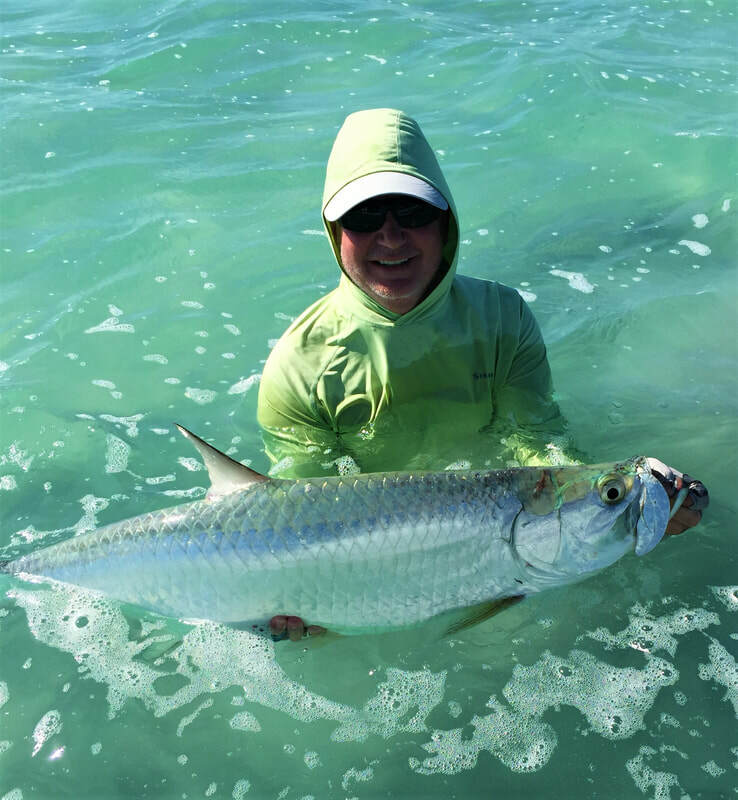 In October, resident tarpon (about 20 to 60 lbs.) are in abundance and provide great action. 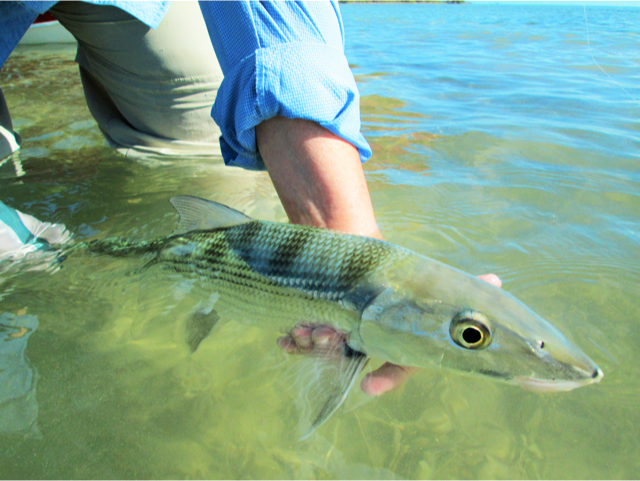 In addition, a few of the bigger migratory tarpon are usually still hanging around. 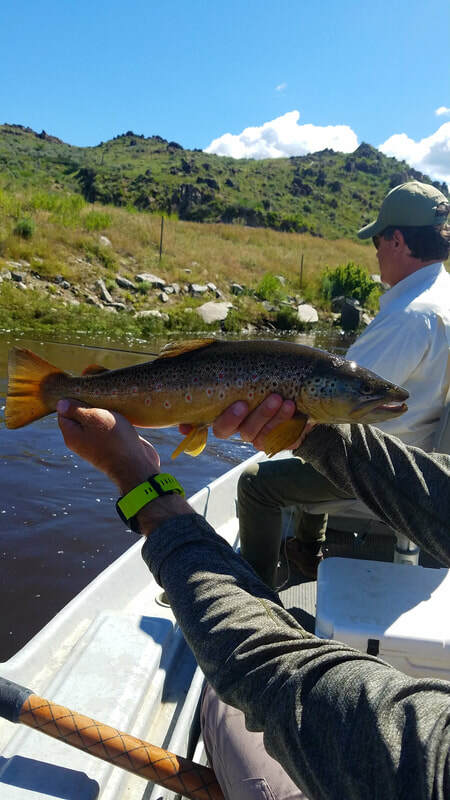 The real beauty of El Pescador fly fishing is how it offers something for all fly fishers…from novice to old salts. Each angler can choose his or her challenge level for the day. Start with the less challenging schools of bonefish then move to the elusive permit and hard charging tarpon for greater challenges. Due to the popularity of this trip I am hosting two trips instead of one in 2019. 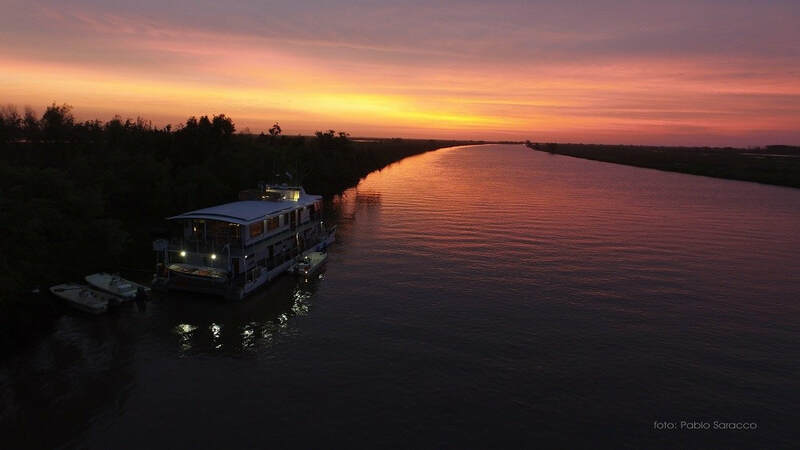 The first trip is October 15-20, 2019 and the second is October 20-25, 2019. 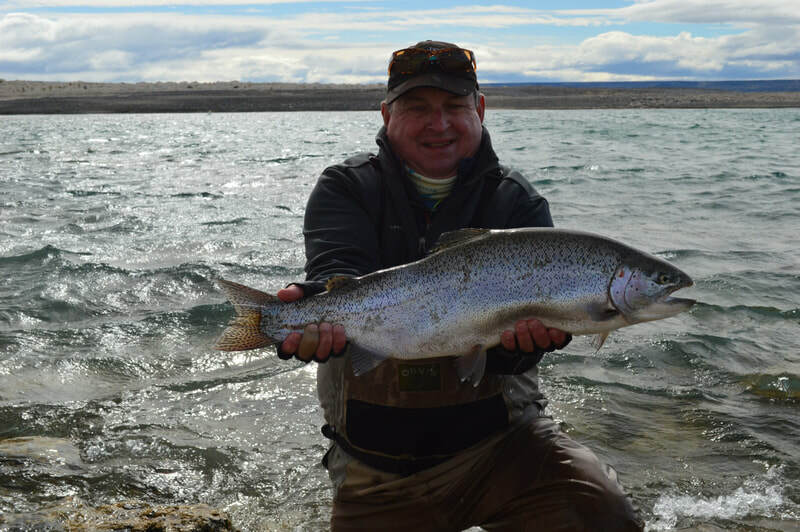 The package price includes five nights lodging and either three or four days of guiding fishing depending on which package you prefer. 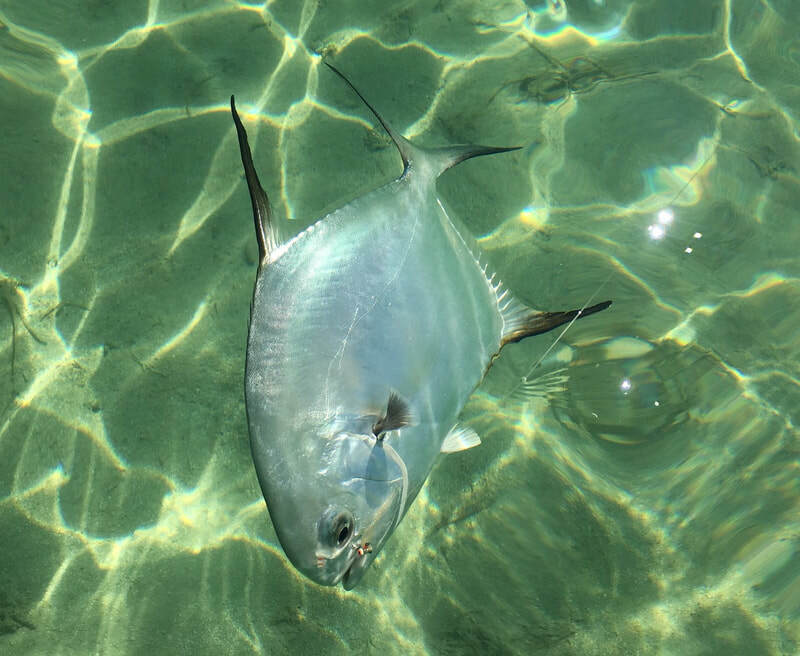 If you pick the five night/three day package then the extra day can be used to just relax at the lodge or enjoy one of the mainland tours or other activities (snorkeling, reef fishing, kayaking, and more). Just fly into Belize City and things are taken care of from there. 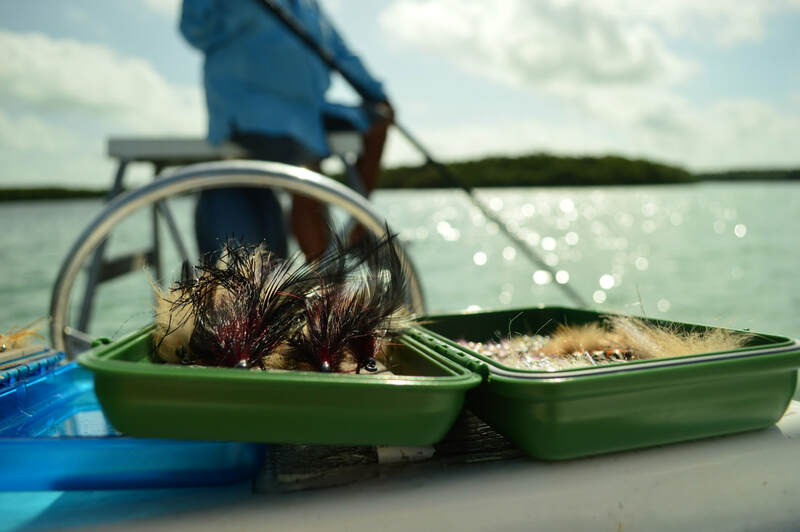 The package price includes the short 15-minute island hopper flight to the small island village of San Pedro and then a short, boat ride to the lodge. 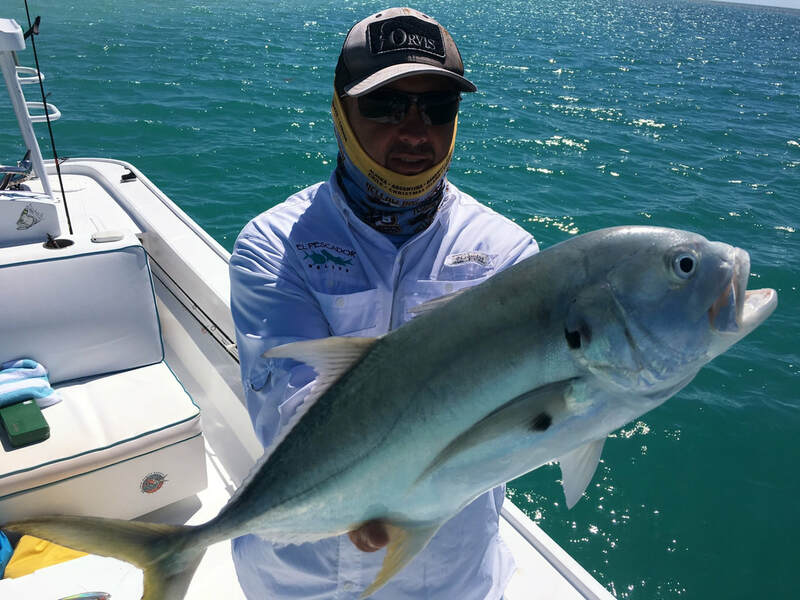 The cost for one or two anglers is only $4825 for the five night/four day package and $4225 for the five night/three day package. 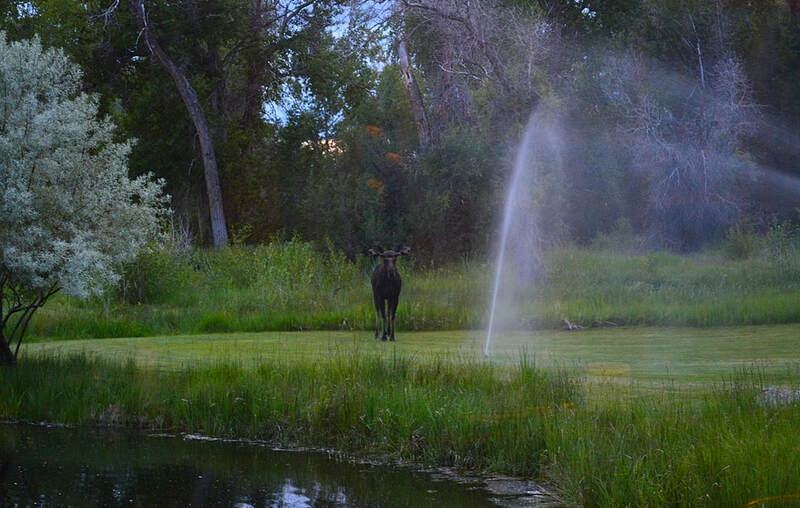 This is where one angler pays for the single occupancy package and then the other angler goes FREE! Or two anglers can split this for an unbelievably low price. Discounts for true singles are also available if you want to fish and room alone. 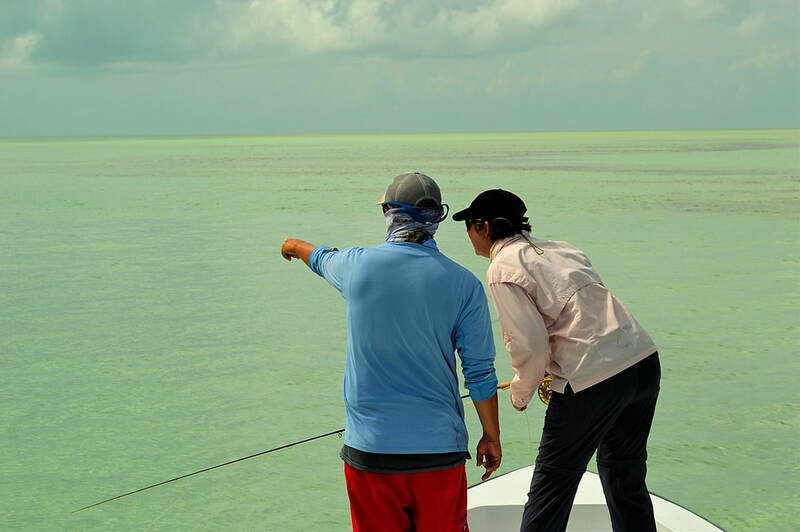 Your trip can be customized to your preference in terms of length of stay, number of days fishing, other activities, etc. For those developing their fly fishing skills we have fun casting sessions available every afternoon. These trips have very limited availability as only a few slots remain. The first trip is half full and the second is full. Join me in June 2018 on a trip to Montana that I know will be remembered for all the right reasons. This will be a safe and easy trip to Healing Waters Lodge during one of the best known and consistent super hatches in North America...the salmonfly hatch on the Big Hole River. 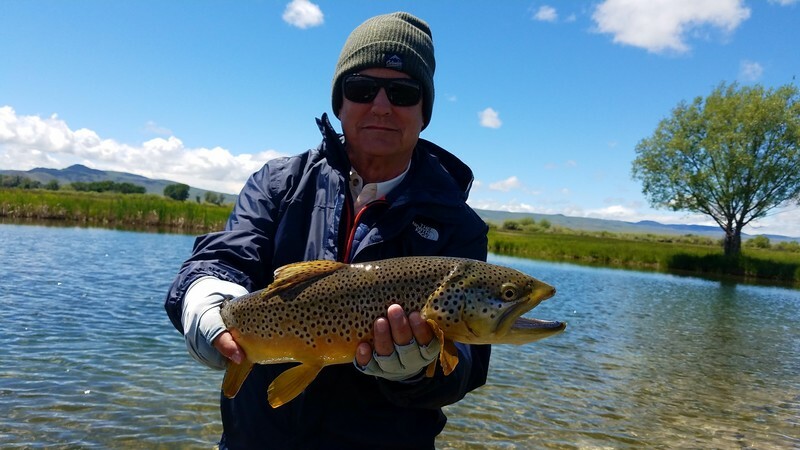 The Fishing​: Although many options are available when it comes to the fishing at HWL, the timing of this trip is based on the peak period of the salmonfly hatch on the Big Hole. 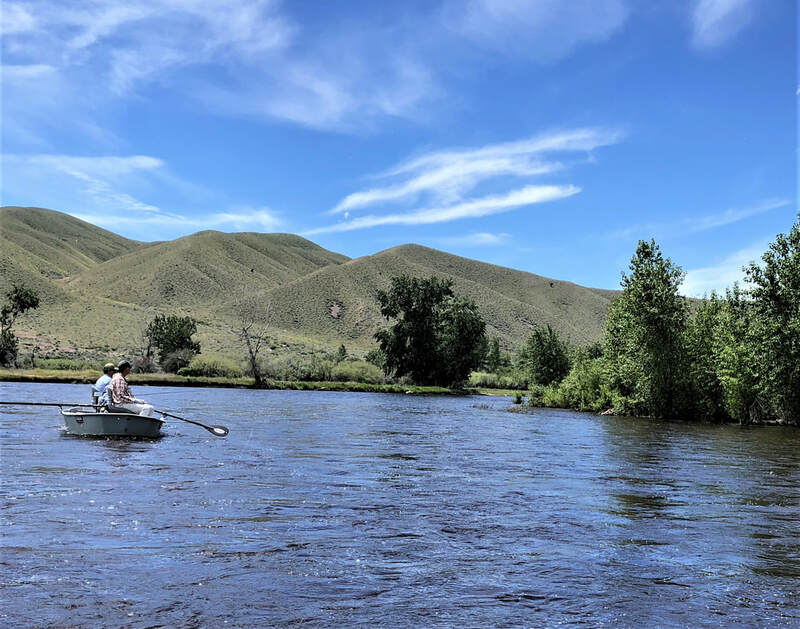 The Big Hole is over 150 miles of free flowing river set in a remote, sparsely populated valley in southwestern Montana. 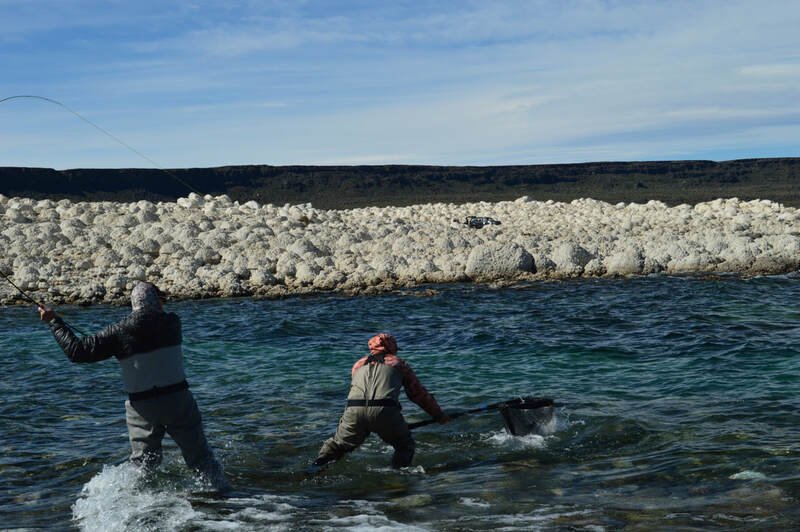 It is home to a viable population of fluvial Arctic Grayling, one of the very few left in the lower 48 and is a testament to the health and vitality of the river. 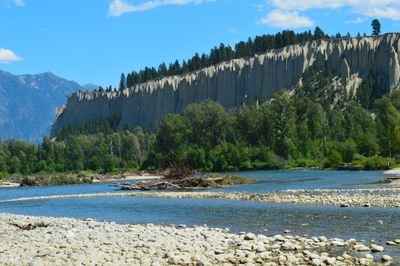 It is also home to this legendary hatch of giant stoneflies which begins in earnest about mid June. 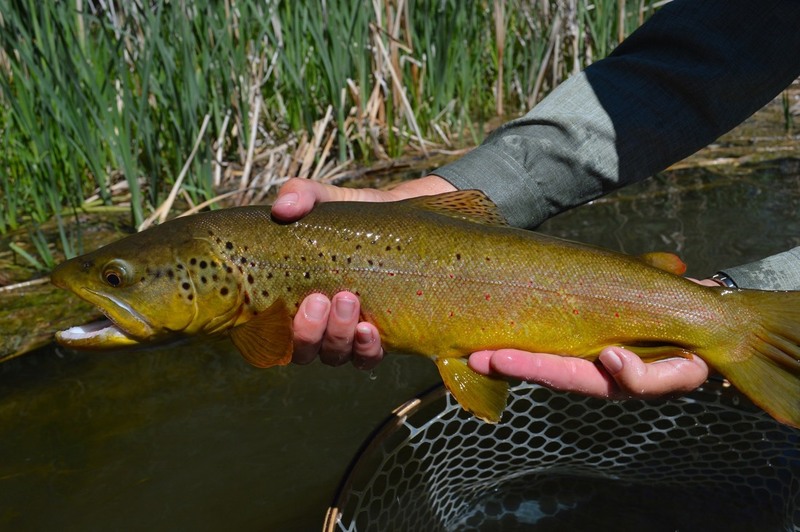 The adult stoneflies (Pteronarcys californica) are big, about 1 to 2 inches in length and epitomize Montana trout fishing...big flies, big rivers, and big fish. This is a well known hatch, so we can expect to see other fly fishers. 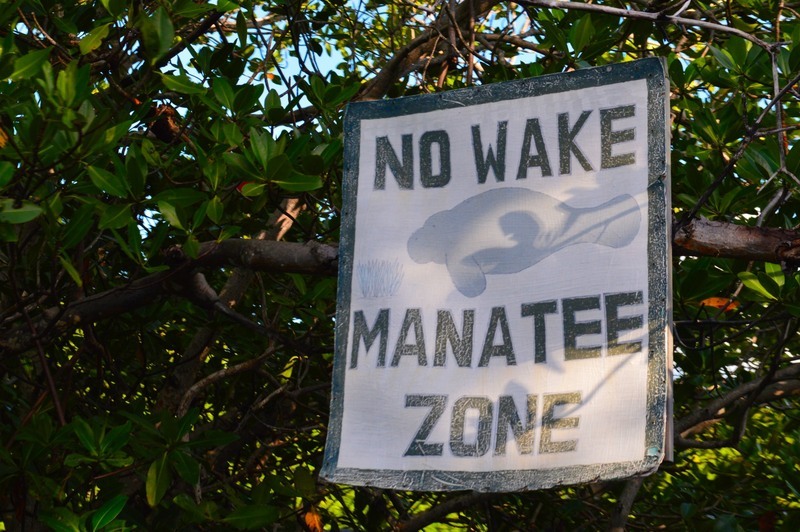 However other waters, both public and private, can offer more solitude if needed. This includes the Beaverhead, the Ruby, and miles of private water. 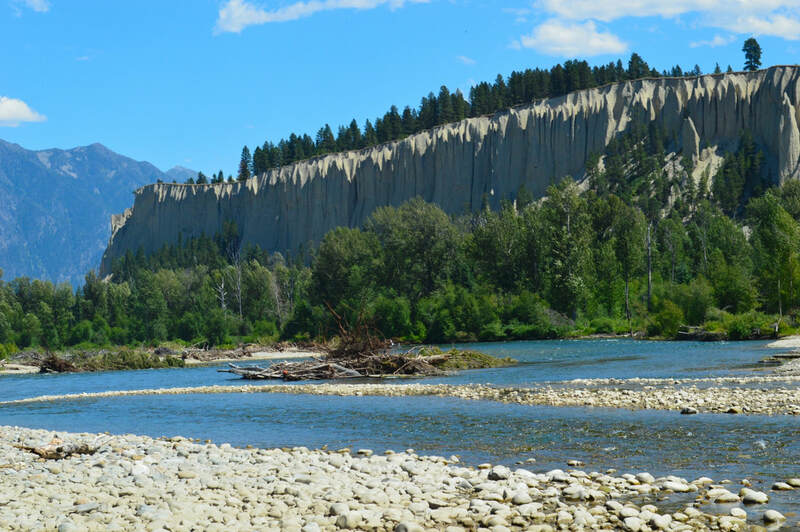 Everyone should fish the salmonfly hatch on the Bighole at least a time or two...casting big, dry, stonefly patterns to fish looking up on one of the most beautiful rivers of all! 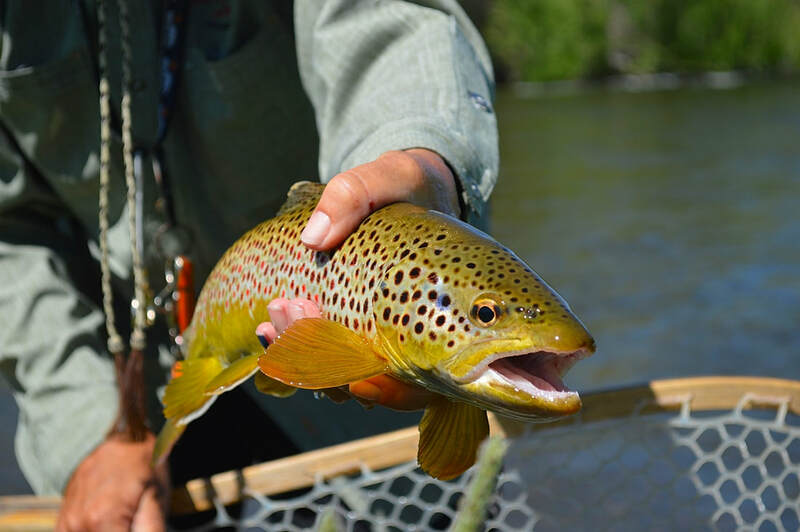 ​The Lodge: HWL is an Orvis Endorsed Lodge with an ultra-strong following of repeat guests...due in large part to the vast amount of high quality trout water and the excellent job they do of providing the best possible total experience. 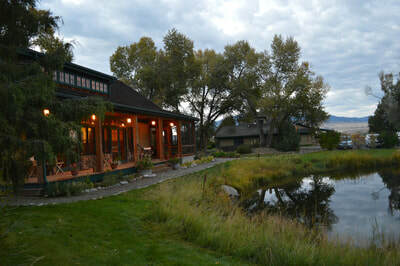 The lodge sits squarely in the heart of the Ruby Valley...it is large yet conveys an intimate feeling with the landscape. 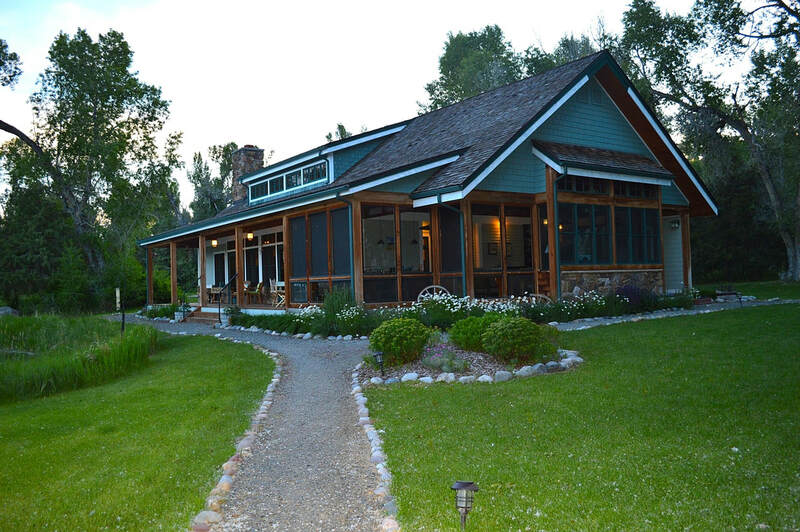 And it provides all one could want for including a hot tub, laundry service, exercise room, casting pond (with trout), a well-stocked fly shop w/loaner gear, pool table, reading room, and a guest business office. They will accommodate any dietary restriction or preference. The Details:​ Trip dates are June 12-17, 2018. 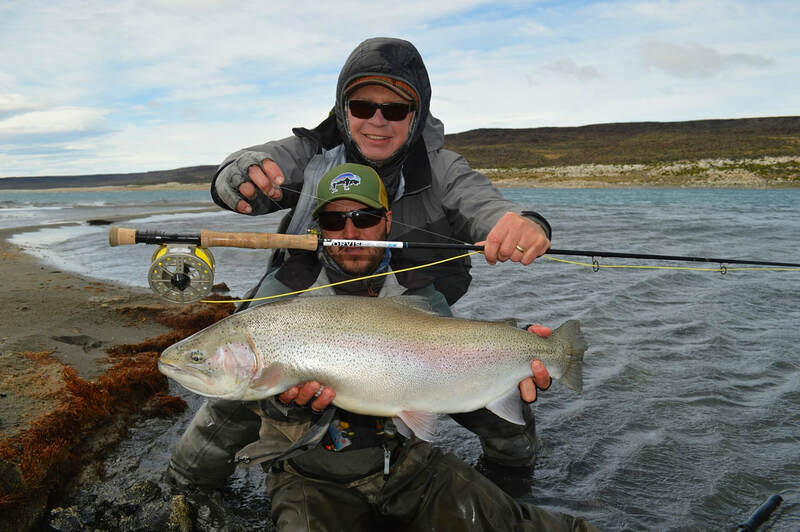 This is a 5 night, 4 days of guided fishing package. June 12 is arrival day. 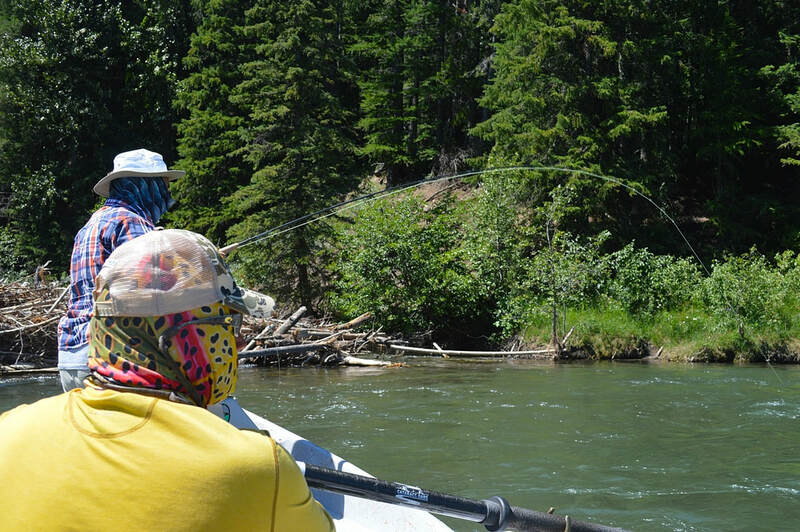 June 13-16 are fishing days. June 17 is departure day. Trip can be customized for a longer period if desired. ​The cost is $3675 per person based on double occupancy. This is good until December 31, 2017. 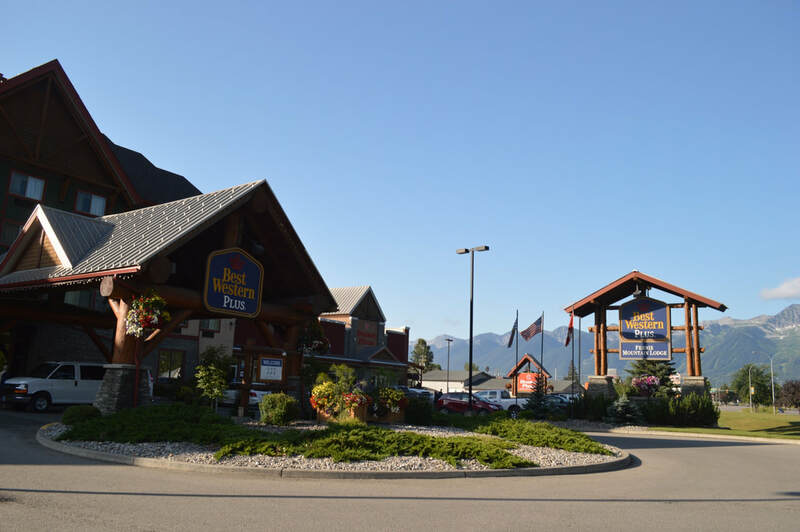 Prices increase in 2018. 50% deposit required at time of booking with balance due at the end of the trip. On the afternoon of 6/12 I will present a short workshop designed to tune-up casting and slack line skills for those who are interested. Similar sessions can be held as needed through the trip. 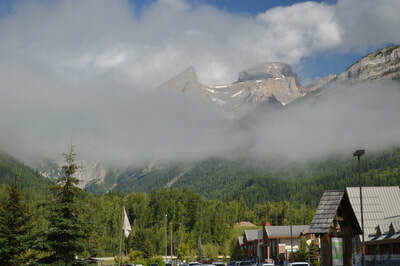 ​This trip has very limited availability due to the timing of the trip. It is in the high demand season. Book now and reserve your slot with 2017 pricing. ​​Email or Call Steve Hollensed for booking or more information.